Note: This is the second in a series of articles on array modeling software and acoustical technologies. 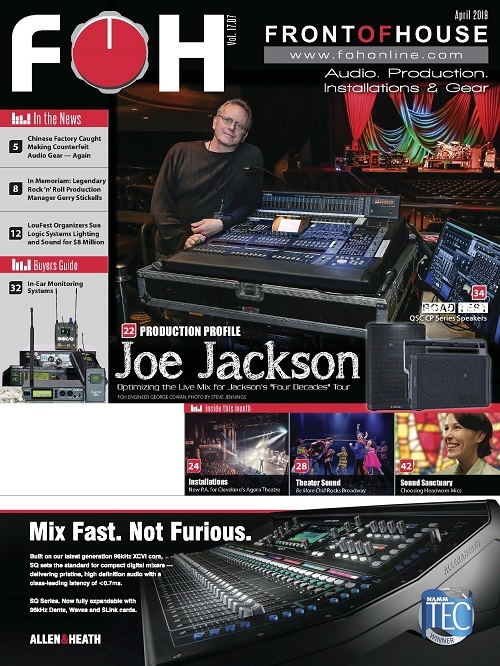 For more insights into the topic, see the author’s “What to Expect from Loudspeaker Modeling,” FRONT of HOUSE, March 2019, page 30 (and at http://fohonline.com/articles/tech-feature/what-to-expect-from-loudspeaker-modeling/ on fohonline.com) —ed. Early attempts at loudspeaker array modeling/simulation used optical models of the various horns to estimate sound coverage. No attempt was made to simulate low-frequency sound coverage or loudspeaker interaction. With the introduction of computers, large institutions could greatly decrease the time it took to conduct the many calculations needed to predict Reverb Time (RT) in a real venue. Since the late ‘80s, Macs and PCs have been used to run live-sound modeling programs, still based on optical/light modeling, to simulate sound. JBL Professional’s CADP was the first, very basic, personal computer-based simulation, with an attempt to show loudspeaker interaction, but the graphic display was rudimentary (too few data points). Bose introduced Modeler, an advanced acoustic and loudspeaker modeling program. It took advantage of the improved graphics of Apple’s Macintosh computers to significantly advance the state-of-the-art, with much higher-resolution coverage mapping and a 3D view of the venue. Modeler was wide-range, intuitive to use, and allowed the system designer to see the direct sound coverage from any perspective desired, and it displayed a Ray-Trace study of echo paths along with RT. Early releases ran only on Mac computers and had a variety of loudspeaker brands, models and acoustical materials included in its database. Other live-sound loudspeaker manufacturers soon followed suit. Altec’s Acousti-CAD failed with the company’s demise. JBL Pro responded in the early ‘90s with CADP2, its second-generation simulation program for PCs; it was also, an intuitive, high-res 3D program, allowing system designers to see the direct sound coverage of point-source loudspeakers in any perspective desired, and could display a Ray-Trace study of echo paths along with RT calculations. (JBL no longer develops nor supports CADP2). The Cluster Computer, E-V and PHD modeling tools fell from favor. The EASE program, developed by ADA (Acoustic Design Ahnert), came out next. As it was not tied to a specific speaker line, EASE was quickly adopted as a generic/universal design tool for use with several brands of loudspeakers. Over the decades, increases in PC processing speed allowed simulation developers to build on the progress. More advanced large-room acoustics and array modeling programs became available, offering improved prediction and signal processing algorithms. More full-featured programs showed frequency response graphs and offered auralization of multiple room models and listener positions. This allowed demonstrating audible sound clips to buyers of what the proposed sound system would sound like in different locations, in a venue and in various acoustical conditions (with or without treatment). Bose Modeler remains one of the most intuitive of these to use. It currently provides estimated STI (Speech Transmission Index) and now runs on Windows PCs. The Yamaha Y-S3 Sound System Simulator has a more limited set of features — it features auralization of point-source speakers and is very quick and easy to use, but does not offer acoustical analysis. The more advanced/costly software versions/suites by CATT-Acoustic (auralization version), EASE/EARS and ODEON (Auditorium edition), also provide advanced auralization functions. Although more difficult to use than the basic programs, EASE provided a large database of loudspeaker brands and acoustic materials, so it became the dominant program for high-res 3D speaker array modeling, to compare predicted sound coverage (A.K.A. a “heat map”), and it can do related room acoustics and STI simulation with the AURA acoustic modeling module. For expert acoustical designers, CATT-Acoustics and ODEON are more popular worldwide than ULYSSES. These days, it seems most array simulation is done on one of the several line-array simulators like EASE Focus. These 2D programs tend to be available for free; many of them were only showing a 2D side view (as if cutting a section), but 3D views are now available. Note that free sound modeling simulators (A.K.A. Line Array Calculators) as shown in Figs. 3 & 4 are not able to do any array-room interaction nor acoustic simulation (such as echoes or RT). Sound contractors still use various EASE program versions, due to its large database of acoustical materials and loudspeaker brands that can be compared in a venue model. It seems that AFMG was focusing its resources on advancing the more popular and basic/free EASE Focus modeling software, as the simulation of cardioid sub arrays and FIRmaker optimization technology is now included with EASE Focus. The more robust EASE program is now receiving attention, with the expected release of a new version in the next year. R1 Remote Control software by d&b audiotechnik confirms that arrays are cabled and working right. 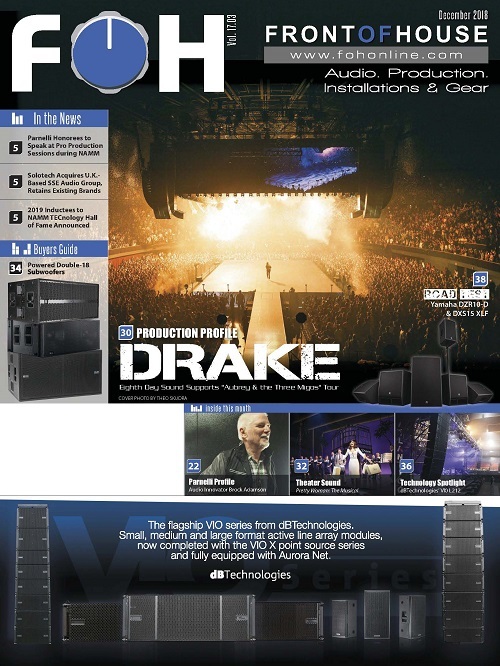 L-Acoustics’ Soundvision can operate in real-time and has a world venue database. Martin Audio addresses noise pollution and echoes with its Hard Avoid feature in Display. The new Bose Array Tool is a basic program that claims to need very little training; but, like many, doesn’t offer room simulation and is currently only for the PanarayMSA12X modular/mini beam-steering columns. Regardless of brand, a good sound system alone does not assure good sound quality. A sound system is not complete without adequate (program appropriate) room acoustics. Sound systems can rarely cope with serious defects in a room design, and a more powerful system commonly makes such defects worse. Proper architectural acoustics design includes a well-modeled room, and the study of how loudspeaker arrays interact with the architectural acoustics (control of sound reflections), to prevent costly acoustical flaws before a venue is built. A commonly overlooked acoustical issue is control of noise from HVAC, traffic and sound transmission from adjacent spaces. A noise control specialist may be needed to ensure that the assembly, performance or worship space not only sounds good, but is also quiet (another type of signal-to-noise-ratio). For a more advanced understanding of the variables and choices entailed in proper acoustic design for performance and worship, read a book like Dr. Honeycutt’s Acoustics in Performance. 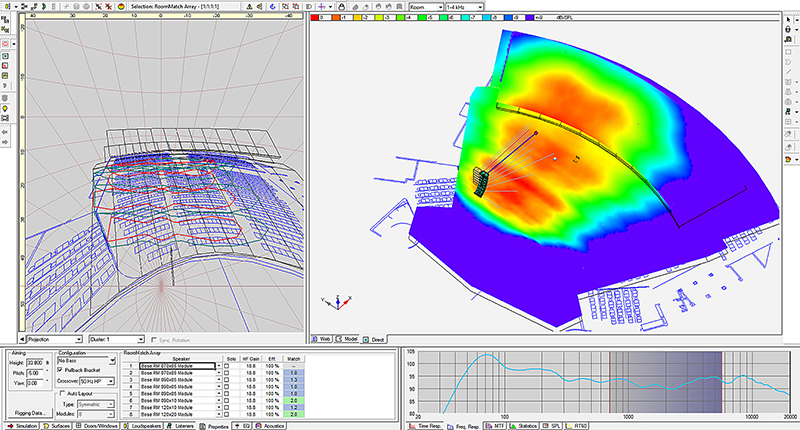 For advanced analysis of array performance in an acoustical venue and/or to design/study critical acoustical projects, such as concert halls, most acoustical design consultants use an acoustic modeler/simulator, such as CATT-Acoustic, EASE/AURA or ODEON. These are all international standards for advanced acoustic simulation of performance venues, with add-on auralization modules. An acoustical venue can be defined using the room geometry and absorption or scattering coefficients can be assigned to surfaces and sound sources, as well as listener positions can easily be added to a 3D model. 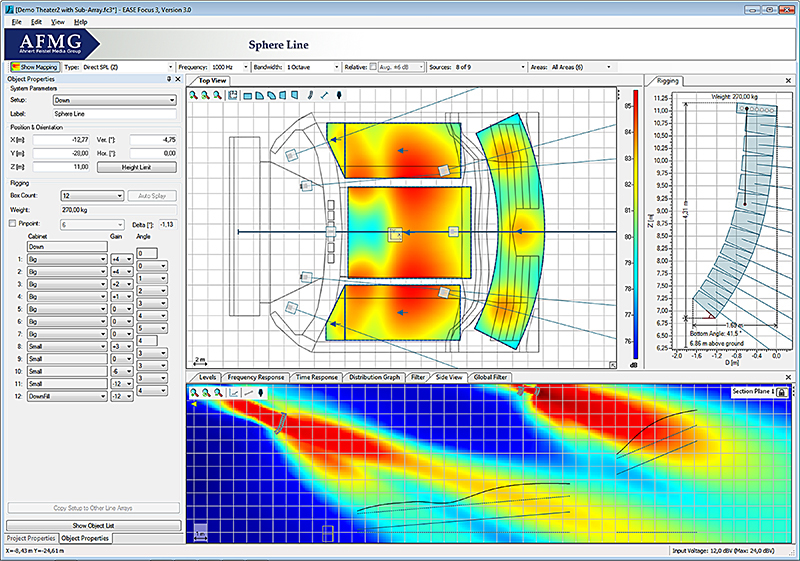 All three acoustical simulation programs offer various program modules and packages. 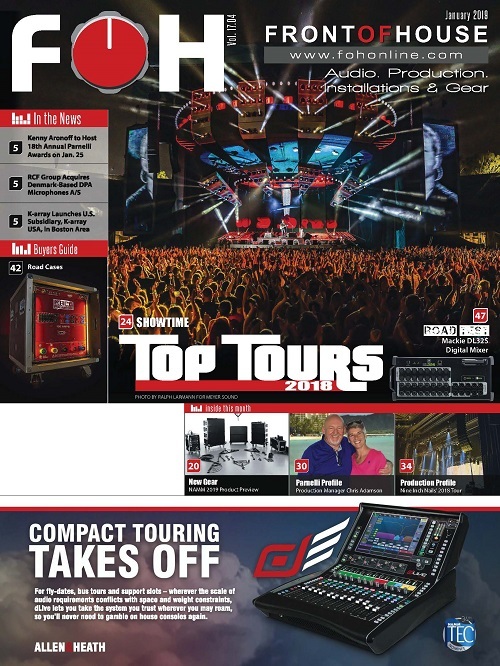 As a sound consultant, I am frequently asked for loudspeaker recommendations; and typically, my answer is, “It depends.” Here, the variables include the budget, venue size/shape, SPL, program material, and if it’s a quick one-off event with arrays on-hand or a new system that requires optimized coverage in a venue installation (including interaction with the room acoustics). Once these issues are taken into account, we can move to the appropriate choice of a type of modeling/simulation program. Some sound coverage mapping programs are limited to direct field point-source loudspeaker simulation for a specific manufacturer’s loudspeakers, and are easy to use. Danley Direct is a 3D direct field mapping program that runs on either Mac or PC (also for subwoofers); it has been optimized for speed. 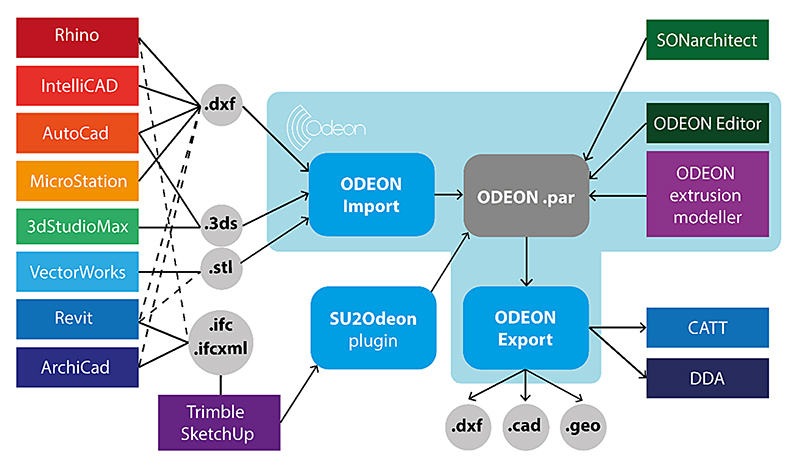 Direct can import files from SketchUp via a Danley plug-in. The Yamaha Y-S3 Sound System Simulator has a similar feature set, adding auralization and in-program room/venue templates, to speed model construction. But neither of these sound mapping programs are intended to consider echo paths nor RT. 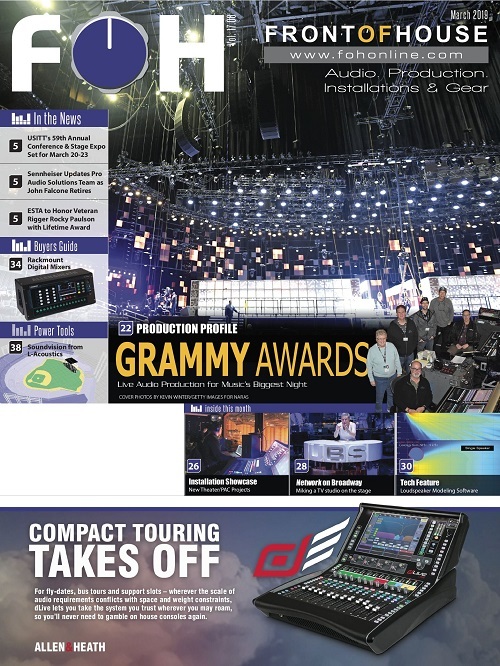 The modern, hardware-specific line-array modeling and control software programs — also no cost from most manufacturers of live-sound loudspeakers — are quite useful for regional and touring sound companies that own the same brand of line-arrays, as they provide quick array-specific direct-field coverage prediction with control and monitoring functions not generally available in third-party software, such as: auto-splay, beam-steering, cardioid sub-array design, headroom simulation, FIR EQ, mobile apps & mechanical CAD/data. But most of the speaker modeling programs have limited mapping views and cannot predict room acoustic parameters. 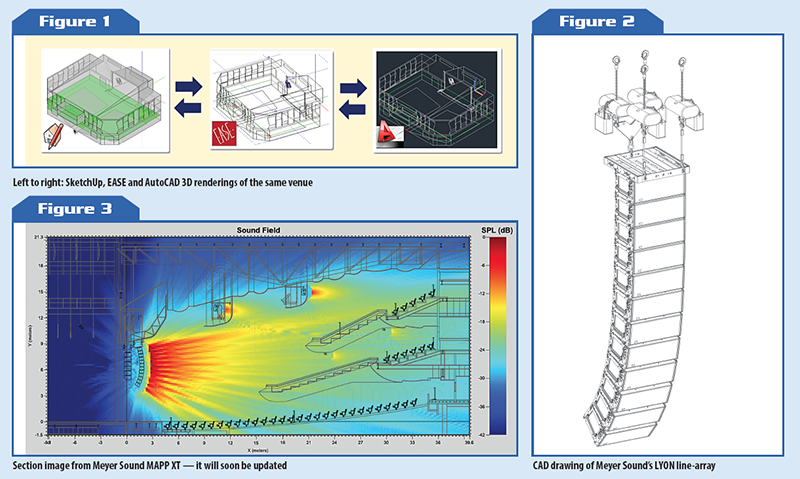 While not the most advanced program for the design of critical acoustical projects, and it does not have an extensive loudspeaker database, Bose Modeler 6 (shown in Fig. 5) is still one of the easier 3D programs to use, and may be the only fairly full-featured acoustic and array program now freely available. Modeler features a quick isobar aiming aid and a function, which matches the acoustic performance of the model to that of the real room. Array tools also help automate the creation/splay of complex Main & Sub arrays. The latest version of Modeler opens the database and merges previous versions, offering the auralization of sound files. With the addition of more advanced and extra-cost simulation modules, programs such as CATT-Acoustic (auralization version), EASE w/AURA/EARS, and ODEON Auditorium have continued to offer an increasing range of features for in-depth analysis and auralization of critical acoustical projects, along with more accuracy for the modeling of array coverage and simulation of speech intelligibility. 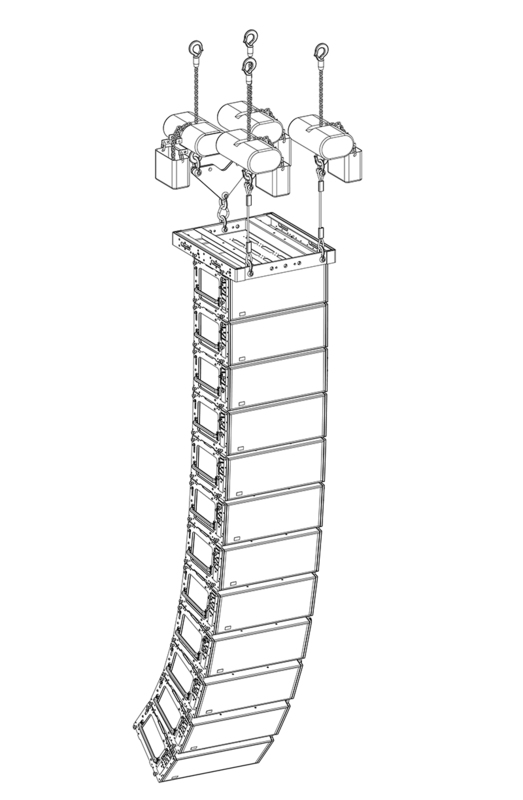 EASE has the largest loudspeaker manufacturer database and user base for array modeling. CATT has a unique method of accurately modeling coverage of line-arrays at high-frequencies. ODEON can be used for the design of critical/large acoustic spaces, and with loudspeakers. Both CATT and ODEON work only with Common Loudspeaker Format (CLF) data, which not all loudspeaker manufacturers support. However, with the exception of EASE, these advanced acoustic modeling/simulation programs do not have the array control and monitoring functions of the group of hardware-specific type of line-array coverage prediction/control programs described above. Build the room model in SketchUp, or source the AutoCAD room file from the architect. Study the array coverage in a (line) array simulator, then export arrays as an EASE file. But the reality is that moving from steps 2 to 3 can be difficult, because some modeling/simulation programs use the CLF data format, rather than EASE data. We will cover advances in these acoustic and array modeling programs in future articles. Most of the older sound modeling programs could not model very-low frequencies, while multiple modeling programs can now do simulation of cardioid sub arrays. Next month, we will look at full-range and sub array mapping, including more accurate simulation of cardioid/directional (both end-fire and gradient types) sub-woofer arrays, along with free-space polar-plot cardioid array simulation. David Kennedy operates David Kennedy Associates, a company specializing in the design of architectural acoustics, AV Systems and custom loudspeaker arrays. He has designed more than 300 auditorium sound systems including churches and performing arts centers. 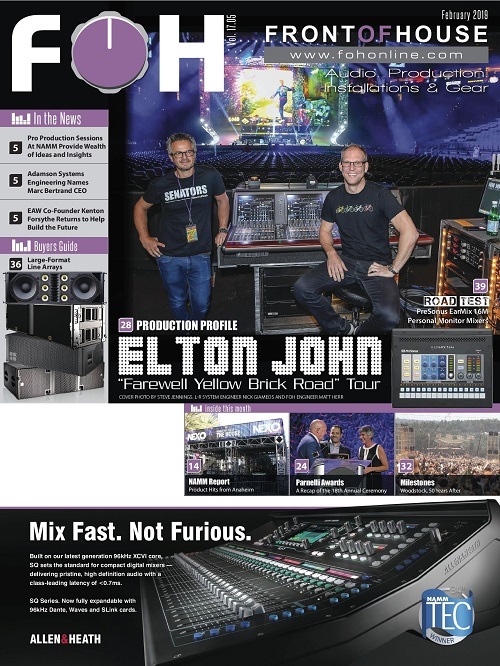 For Part 1 of this article, see FOH, March 2019, page 30. For more info on David Kennedy Associates, go to line-arrays.com.